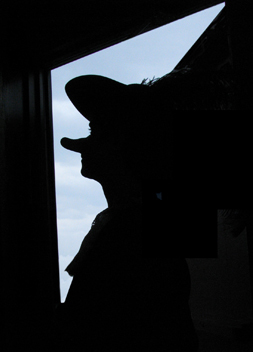 Apollinaire Theatre Company Presents "Cyrano de Bergerac"
Continuing its tradition of showcasing theater "on the move," Apollinaire Theatre Company will present Edmond Rostand's "Cyrano de Bergerac" in several locations along the Chelsea Waterfront from July 14-31. All performances, presented in both English and Spanish, are free. Apollinaire is celebrating its eighth season offering New England's only bilingual free summer theater in the park. Cyrano, the proboscisly challenged master swordsman and poet, is too ashamed of his large nose to woo his beloved Roxane. Resigned, Cyrano uses his mastery of words to win Roxane for another suitor, the dashing yet tongue-tied Christian. But when Roxane finds that she loves Christian for his mind, not for his beauty, which of her two suitors will finally possess her heart? The play's five acts -- full of comedy, romance, adventure, heartbreak, courage, and love -- will be performed in five locations throughout the park, with the audience moving with the action. Audiences are encouraged to bring blankets and beach chairs, as well as a picnic to enjoy along with the live pre-show music and the water views. Danny Bryck plays the iconic French role of Cyrano in both English and Spanish. A 2009 graduate of Boston University's BFA Acting program, Danny has already made a name for himself in theatres around town in shows as diverse as Whistler in the Dark's "Family Stories," American Repertory Theatre's "The Donkey Show," Huntington Theatre Company's "The Corn is Green," and New Repertory Theatre's tour of "Animal Farm." His performance as Hedwig in "Hedwig and the Angry Inch" earned him an IRNE nomination for Best Actor. He can also be seen performing with ImprovBoston, in independent films, and recently in a small recurring role on "As The World Turns." The production is staged environmentally in multiple locations in Mary O'Malley Park, Commandant's Way, on the Chelsea Waterfront (Admiral's Hill). Note that English performances are Wednesdays, Thursdays, and Saturdays, with Spanish performances on Fridays and Sundays. For information, call 617-887-2336 or visit www.apollinairetheatre.com. To check performance status in the event of bad weather, call 617-2336.